London, UK – Knight Frank launches its Prime Global Forecast 2019, predicting a convergence of price growth across the world’s luxury residential markets. The proliferation of property market regulations, the rising cost of finance, uncertainty surrounding Brexit, and in some markets, a high volume of new prime supply, is weighing on prime prices. 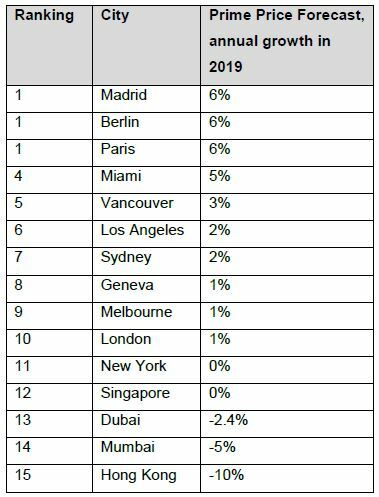 However, key European cities are bucking the trend for lower growth, and are leading the rankings with prices expected to rise by 6% in Madrid, Berlin and Paris over the year. • More cities will enter the ultra-prime market. San Francisco, Chicago, Dallas, Beijing and Shanghai are expected to join the select club of cities where three or more sales above US$25m take place annually.